For Seattle Pacific University freshman Melissa Miles, it seems like yesterday that she played her first song on the piano. “I was 4 years old,” says the music education major. “I remember playing ‘Hot Crossed Buns.’” Today, Miles’ repertoire has grown significantly and includes Bach, Beethoven, and even her own award-winning compositions. 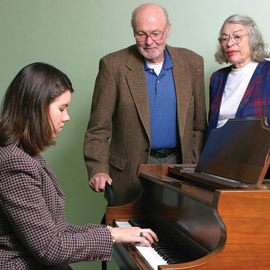 Music education major Melissa Miles plays for William and Sally Hepler on the baby grand piano they donated to SPU. Valuable musical instruments are just one of the creative gifts received from donors during The Campaign. It’s no wonder, then, that she auditioned for a music scholarship at Seattle Pacific. “I was really serious about applying for as many scholarships as possible,” says Miles, who received a piano scholarship as well as academic scholarships from SPU. That’s why gifts to The Campaign for Seattle Pacific University are so important. Take William and Sally Hepler for example. Bill, a retired electrical engineer for the U.S. government, and Sally, a retired elementary school teacher, selected Seattle Pacific to establish a charitable remainder trust for the creation of student scholarships. Throughout their marriage, the Heplers acquired real estate holdings that appreciated significantly under their stewardship. When they sold those properties, their attorney suggested that Seattle Pacific could manage their assets in a trust so the couple would not only support Christian higher education and derive tax advantages for their donation, but also receive regular income from the interest for the rest of their lives. Today, those established trusts are worth in excess of $750,000 and will eventually provide scholarships for dozens of SPU students every year. But the Heplers didn’t stop there. Recently, they decided to increase their contributions even more by donating valuable personal assets they no longer needed. Those assets included a 2003 Winnebago RV, a 1985 pickup truck with only 60,000 miles on the odometer, a lawn tractor, an antique sword collection, and a Baldwin baby grand piano in top condition. Examples of creative gifts include personal residences, farms, vacation homes, and rental properties (commercial or residential), as well as personal property items such as equipment, machinery, airplanes, boats, artwork, rare coins, books, and manuscripts. Donors of these types of gifts often receive significant tax benefits, such as an immediate charitable deduction and the avoidance of tax on any long-term capital gain. Though the majority of the Heplers’ donated items will be sold to fund scholarships, their piano now graces the lounge in Moyer Residence Hall. Moyer is also home to Melissa Miles. “It’s really nice having such a wonderful piano right downstairs,” she says. “There are quite a few pianists in Moyer,” says Miles, who has already entertained her fellow hallmates by playing her own rendition of “The Lord of the Rings” movie soundtrack. Last month, the Heplers joined Miles for a private concert. Far from “Hot Crossed Buns,” Miles played among others “Ballet of the Raindrops,” a song she wrote last year. “She was just wonderful,” says Sally Hepler, who, along with her husband, took the opportunity to tour the Seattle Pacific campus. “I’m very thankful to them,” says Miles. Chances are good that SPU students for years to come will be saying the same thing. For information about establishing a charitable remainder trust, or making gifts-in-kind, contact Sheila Williams at 206/281-2063.